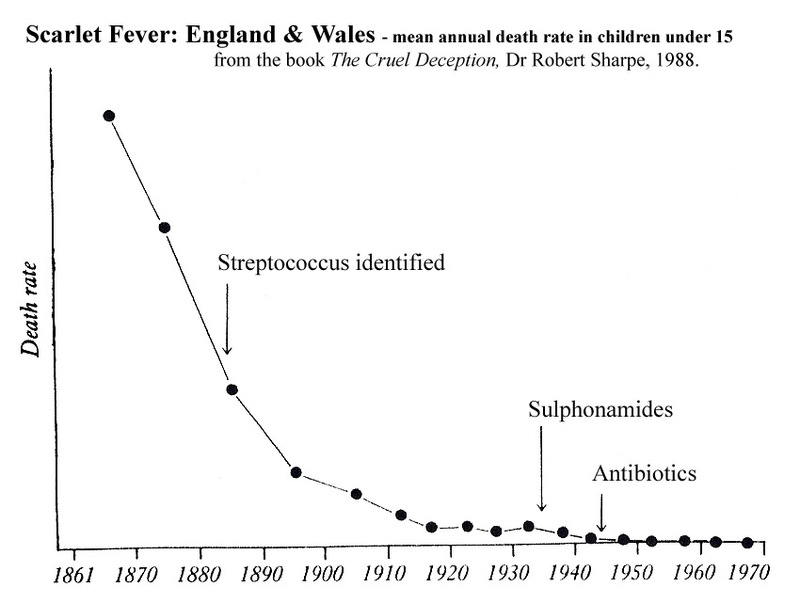 The Decline of the Infectious Diseases is due to improved hygiene, sanitation, improved nutrition etc. 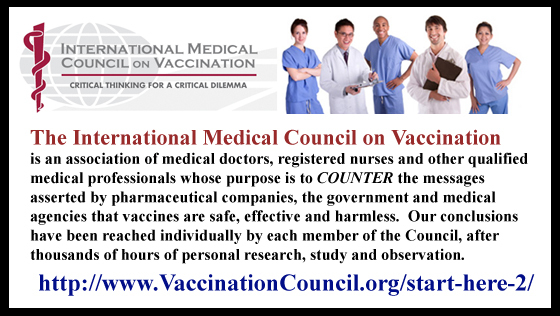 and began long before drugs or vaccines were available. 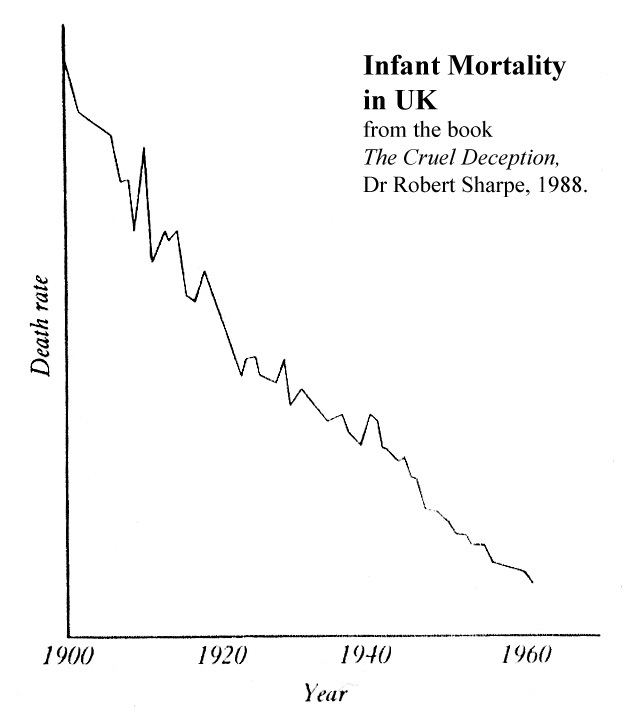 The diagrams below complement the article titled Myths of Modern Medicine: The Increase in the Human Life Span. 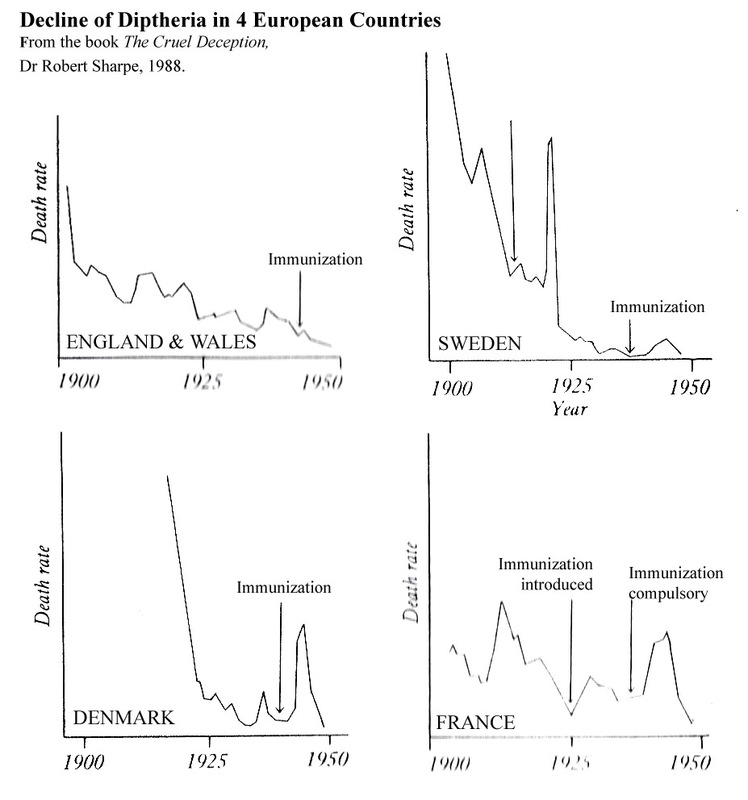 Decline of Diptheria in four European countries. 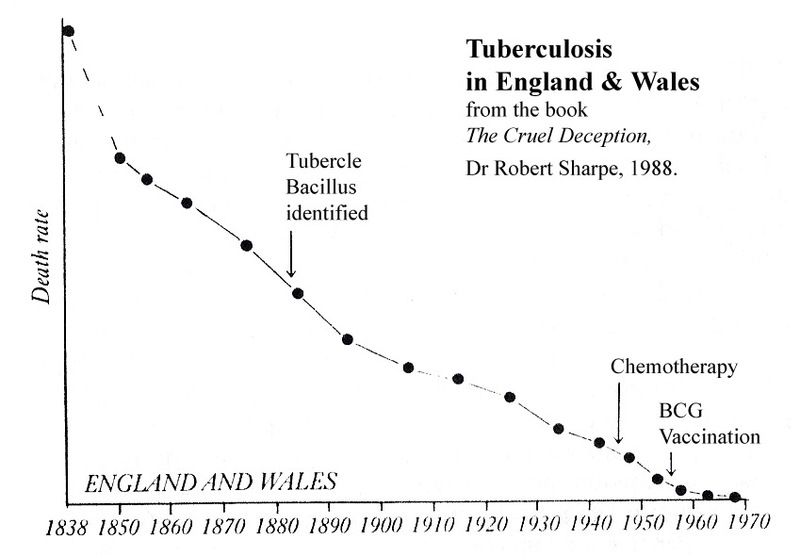 Links to charts for the Decline of Smallpox in England, Wales & Ireland. 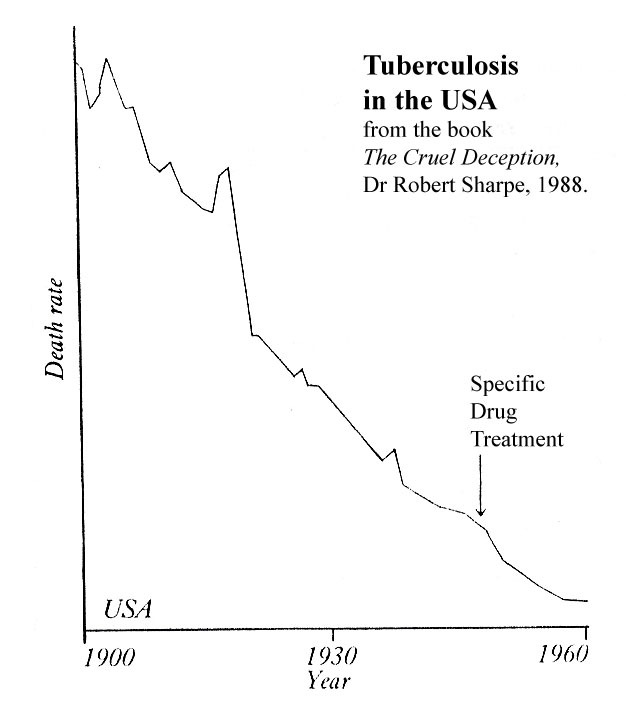 Unless stated otherwise the diagrams below are from Dr Robert Sharpe's book The Cruel Deception, Thorsons Publishing Group, Wellingborough, U.K. 1988, chapter 1. 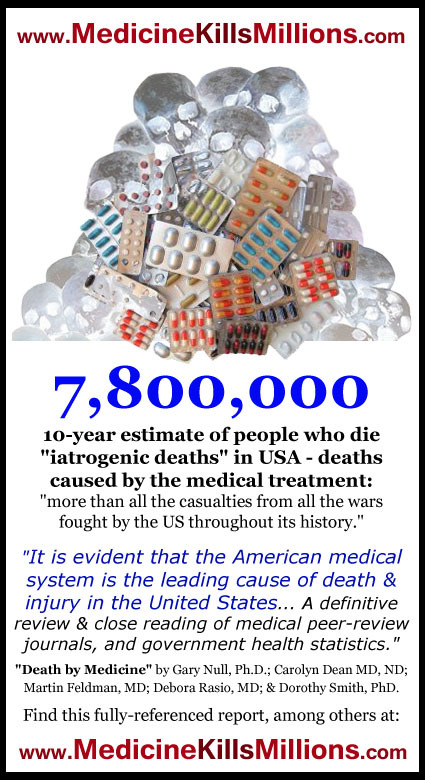 "It is a widely held fallacy that mortality from infectious disease only commenced to fall with the advent of modern [pharmaceutical] agents." 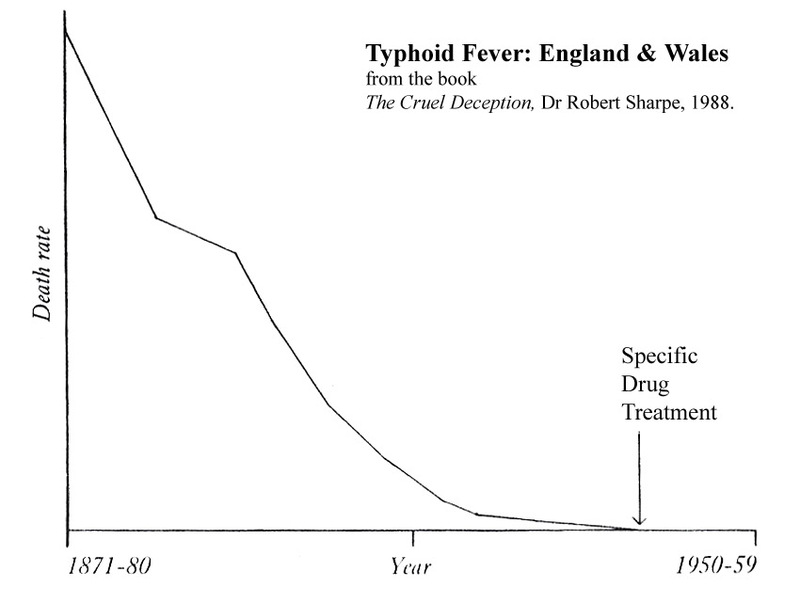 Ramsay & Emond, Infectious Diseases. 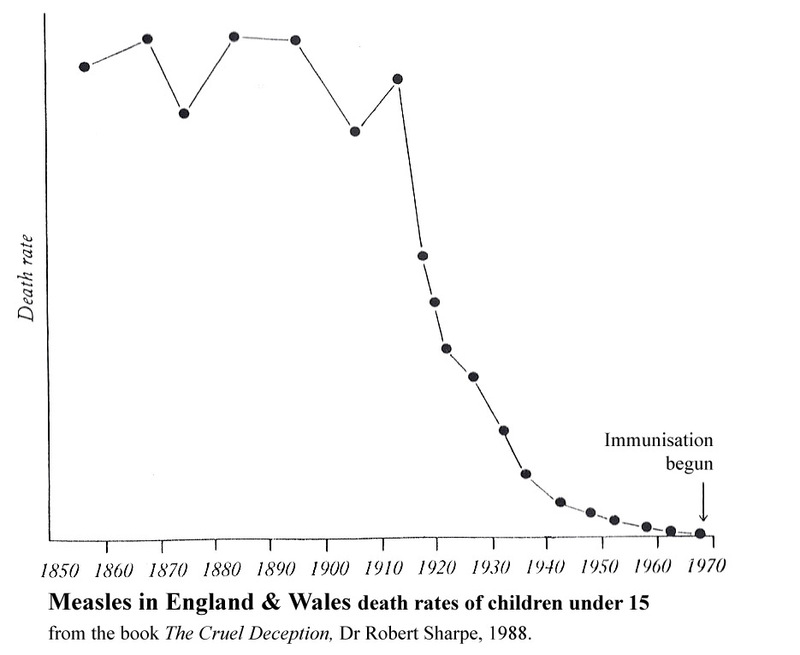 Further information on the decline of infectious diseases and doubts about the effectiveness of vaccination can be found in the article A History of Western Medicine excerpts from a book by the medical historian Hans Ruesch. 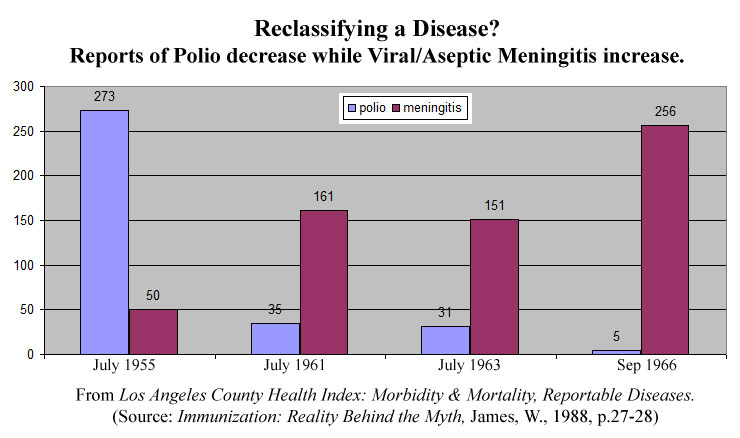 "The authors of this publication offer an explanation for this rather strange inversion of figures: "Most cases reported prior to July 1, 1958 as non-paralytic poliomyelitis are now reported as viral or aseptic meningitis." 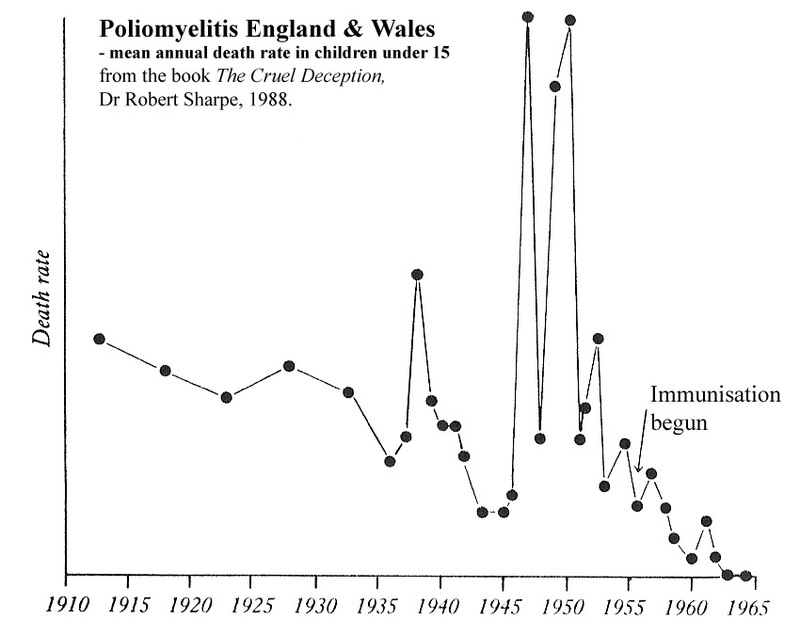 In another masterful example of faulty reasoning, it was concluded that since the vaccine had "wiped out polio", children with similar symptoms must have something else - meningitis!" 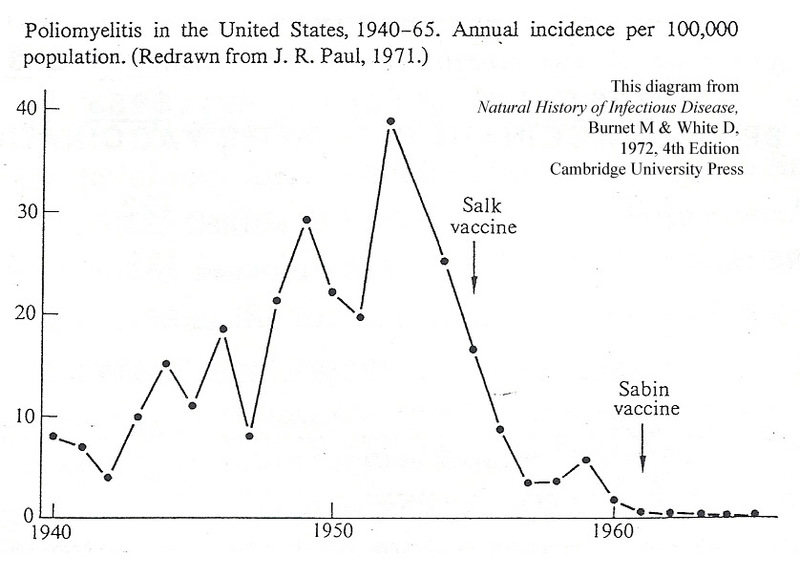 See The Polio Vaccine: a critical assessment of its history, efficacy, and long-term health dangers. 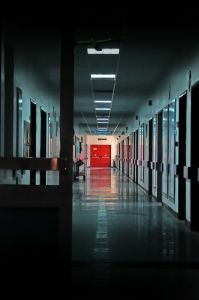 Myths of Modern Medicine: The Increase in the Human Life Span - due to Medicine or Political Social Reforms? This article explains that the great increase in human life span in the developed world (during the 19th and 20th centuries) was due to political social reforms like better sanitation systems and improved hygiene and nutrition. 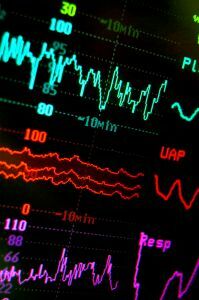 It was not due to pharmaceutical drugs or other medical interventions. 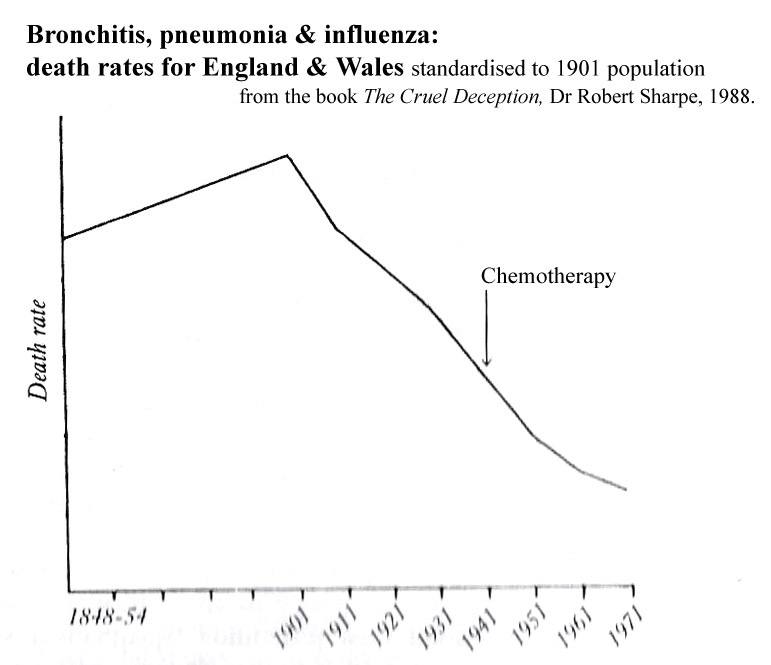 An 11-page PDF excerpt from Dr Robert Sharpe's book "The Cruel Deception" - on the decline of mortality from infectious diseases. 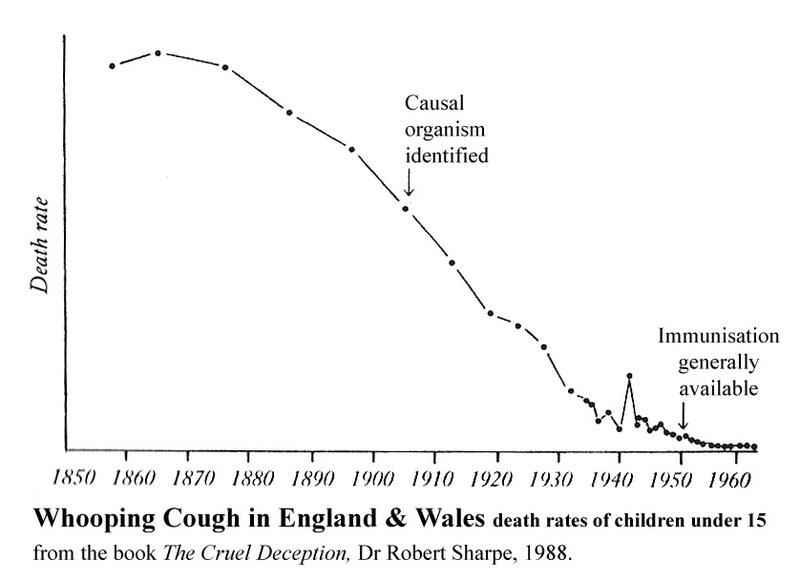 Here is a detailed article on The Decline of Smallpox in Great Britain - Vaccination in Doubt. It includes a critique of Edward Jenner's book and theories. 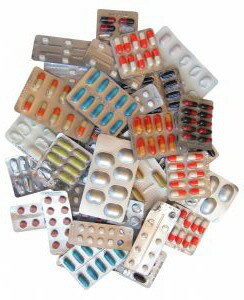 A History of Western Medicine: From ancient Greece to modern times ... a summary of how human medicine: i) progressed due to scientific clinical observations of humans; and ii) was stalled and led astray for millenia due to misleading results from vivisection ... excerpts from a book by the medical historian Hans Ruesch.